Sales got off to a good start for Tesla (NASDAQ:TSLA) in Europe once the Model S made it on the market. Norway in particular, where government EV incentives are high and so are wages, became one of Tesla’s main markets in the early years. This should not come as a surprise given that Norway is emerging as an EV sales leader, given very generous government subsidies. It has been reported by EV Obsession that Norway EV sales have now reached 30% of the total car market. Between the roughly $18,000 subsidy the government provides and the fact that Norwegians have an average net monthly salary of about $3,900, which is among the highest in the world, it should come as no surprise that EVs are doing alright in Norway. Unfortunately for Tesla, it seems to be falling behind in terms of market share in Norway. In 2013, Tesla managed to capture 25.2% of the market. 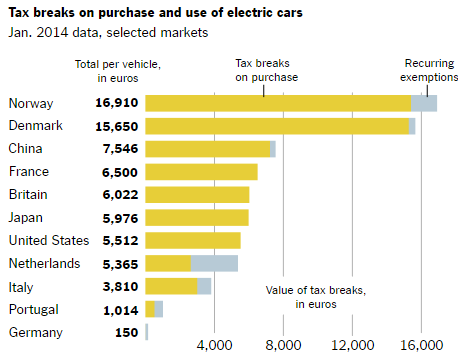 This year, it seems that as of July, it only had 5% of the Norwegian EV market share. The early success of Tesla in Norway gave reason to many people to extrapolate a similar rate of success on other markets in Europe. The deterioration of Tesla’s market share in Norway should give people reason for pause. This is especially so, given that some of the stiffer competition in the EV market in Europe and across the world has not yet begun.